Always use a soft, clean, lint-free cloth to clean your eyeglass lens. 100% cotton fabric is best for cleaning eyeglass lenses. Store your eyeglasses in a case when you are not wearing them. This not only keeps dust and particles away from the eyeglasses, but it keeps them from accidentally being crushed or broken. Do not use ammonia, bleach, vinegar, or window cleaner. They can harm lenses and their coatings. Always lay your glasses with lens surface face up. Keeping the lens surface face up prevents them from coming in contact with things that can scratch the lenses. Be careful not to accidentally graze the lenses. Brush any grime off the nose pads with a soft toothbrush. 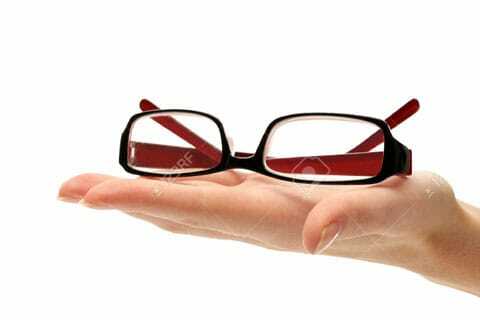 Always remove eyeglasses with both hands. Never peel them off with one hand. Always rinse off your lenses with water, eyeglass spray, liquid cleaner, before wiping or cleaning. Even tiny particles can be abrasive when rubbed across the lens surface. Never leave your glasses in the car. They can be damaged by temperature. You shouldn’t use paper products. Don’t use napkins, paper towels or tissues to clean your eyeglass lens. Don’t clean your glasses with clothing. Avoid use of clothing like the bottom or tail of your shirt. Do not wear your glasses on top of your head.